Until now only cells taken from embryos were thought to have an unlimited capacity to become any of the 220 types of cell in the human body - a so-called pluripotent state. But campaigners have objected to their use on the grounds that it is unethical to destroy embryos in the name of science. In the US only limited use of embryonic stem cells is allowed by scientists receiving public funding. 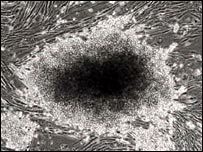 The Japanese team used a chemical cocktail containing just four gene-controlling proteins to transform adult human fibroblasts - skin cells that are easy to obtain and grow in culture - into a pluripotent state. The US team, from the University of Wisconsin-Madison, achieved the same effect by using a slightly different combination of chemicals. They have created eight new stem cell lines for potential use in research. Using skin cells should mean that treatments could be personalised for individual patients, minimising the risk of rejection. Not only does the new technique remove the need to create embryos in the lab, it is also more simple, and more precisely controlled than current cloning technology. Professor Ian Wilmut, of the University of Edinburgh, who led the team which created Dolly the sheep in 1996, has said it represents a significant advance. However, the researchers have warned more work is needed to refine the process, and ensure its safety. At present both techniques rely on viruses to introduce new material into the cells, which carries a potential risk of contamination. Researcher Professor James Thomson said: "The induced cells do all the things embryonic stem cells do. "It's going to completely change the field." Dr Shinya Yamanaka, of Kyoto University, a member of the Japanese research team, said: "These cells should be extremely useful in understanding disease mechanisms and screening effective and safe drugs." Professor Azim Surani, of the University of Cambridge, said the research should allow scientists to create a large range of human stem cell types, which could prove invaluable in studying disease. He said: "It is relatively easy to grow an entire plant from a small cutting, something that seems inconceivable in humans. "Yet this study brings us tantalisingly close to using skin cells to grow many different types of human tissues. Dr Lyle Armstrong, of the International Centre For Life at the University of Newcastle Upon Tyne, called the studies a "major development". He said: "Although it is early days for this technique it may well prove to be every bit as significant as the first derivation of human embryonic stem cells nine years ago." Professor Robin Lovell-Badge, of the Medical Research Council's National Institute For Medical Research, said the work was exciting, but work was required to end the reliance on viruses, and to tease out why two different techniques produced similar results. Josephine Quintavalle, of Comment on Reproductive Ethics, said: "News that embryonic stem cells can be created successfully from human cells without cloning, without using human embryos or human eggs, or without getting involved in the creation of animal-human embryos, is most warmly welcomed. "We congratulate these world-class scientists who have had the courage to state their change of tack so cogently. "For once we have better science coinciding with better ethics." The new technology, nuclear reprogramming, creates stem-like cells from the patient's own cells, avoiding both these problems.